miniature art form should be preserved whether it be the intimate handheld works or intricate large pieces. Fantasy Figures Paintingâ&#x20AC;ŚTheir Popularity Fantasy figures painting have become very popular for various reasons. The tiny sizes of these figures make them highly suitable for wall hangings in your office as well as home. One can also create a unique decorative statement by grouping several mini fantasy figures together for large interiors instead of using one big picture. Other creative ways of using these forms of painting or art form are you can decorate your coffee tables, fireplace mantles, and shelves with these beautiful tiny looking pieces. Grab a Discount of 15% on Your Favorite Miniature!!! 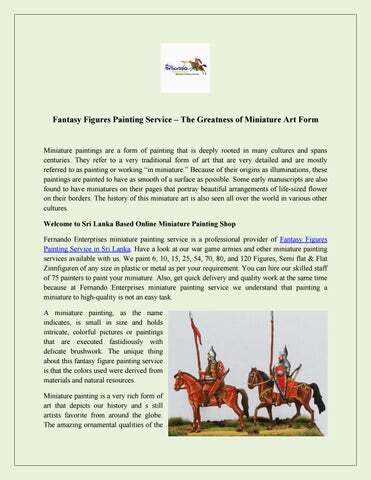 If you are interested in having a tabletop figure, Zinnfiguren or fantasy figures painting services, please email or write to us at figures@sltnet.lk. 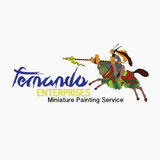 The skilled, experienced painters at Fernando Enterprises miniature painting service will help give life to your unpainted minis at fairly low competitive prices. You can also avail a discount of 15% on the painting charges of your favorite miniature till 31st December 2018 on the orders exceeding US $500.00; GBP375.00; Euro400.00. Hurry Up! Place your order today!